Arguably Uffa was exaggerating - the casualty rate amongst Royal Canoe Club members who served in the war was a little over 8%, which was fairly typical. Its interesting to note that all but one of those who served was an officer, some of them quite senior, which gives something of a picture of the social mix of the club. But its certainly true that activity started very slowly again: only one new Canoe design and very few boats were built in the 1920s. The last B class canoes were built about 1932, but they continued to sail on the Thames along with the International Canoes into the 1970s. In the US there were had been changes to the simple 16 x 30 box rule. In 1913 a special class of canoes to a 17' * 42" rule had been adopted, but in 1917 this and the 16 * 30 rule were effectively combined in a formula in which permitted sail area was allowed above a standard 90 square feet for increases in beam over 30", and reduced for increases in length over 16 feet. Canoe sailing came to Sweden about the turn of the century and the country developed a thriving canoe sailing scene with a number of classes and many more active canoe sailors than the anglophone nations. 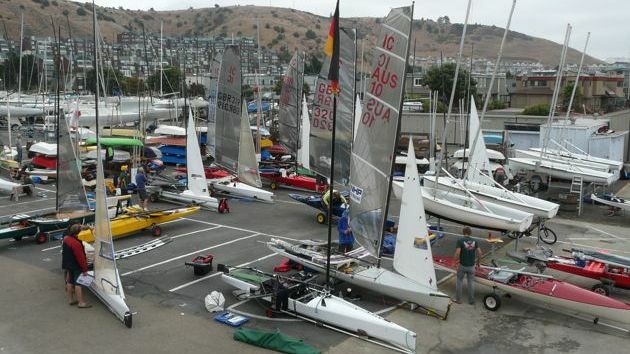 Amongst these the C Class, 5.2m * 1.5m with 10m2 of sail was substantially similar in dimensions to UK racing Canoes. In continental Europe the first international canoeing organisation was formed in 1924 which adopted the 10sq.m Canoe sailed in Sweden as the official International class. Although Europeans had competed in events in Britain before the Great War, they had little contact with the British at this time, who in turn had little (but more) contact with the Americans. The first canoe sailing world championship was held in 1938 in Vaxholm, Sweden, using a craft of German origin with 7.5sq.m. of sail. This event seems likely to have been associated with the first ICF paddling world championships, also held at Vaxholm that year. 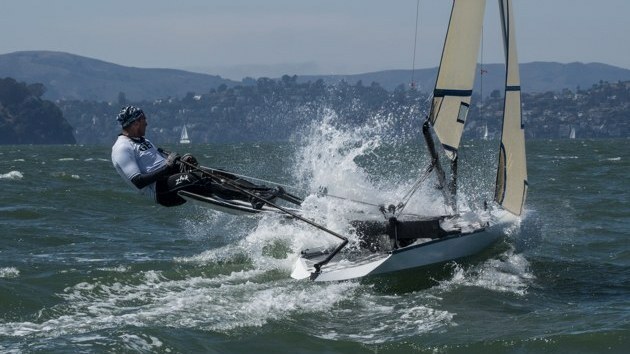 The gold medal went to Eric Ericson of Sweden, and the silver and bronze to Swedish and German sailors. 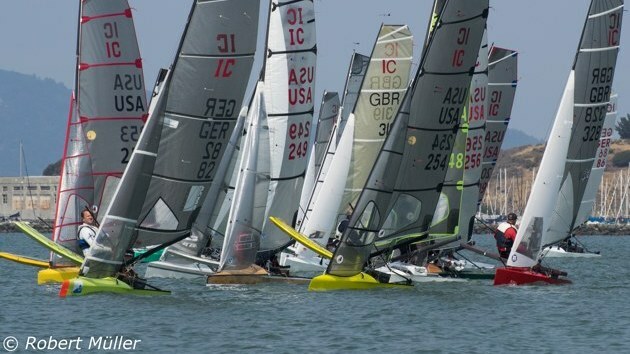 The event was dominated by Swedish and German competitors, and no British or American sailors competed. 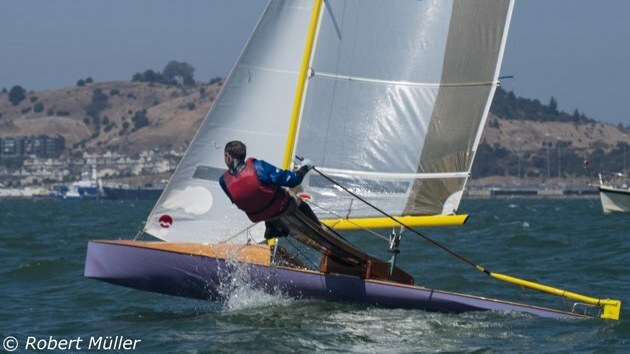 The story of how Uffa Fox and Roger deQuincey won the New York Canoe Club International Challenge Cup may be read starting from this page. Suffice to say that in 1933 Uffa Fox designed and built, for himself and deQuincey, a pair of Racing Canoes that were capable of being raced under both the British and the US canoe rules. 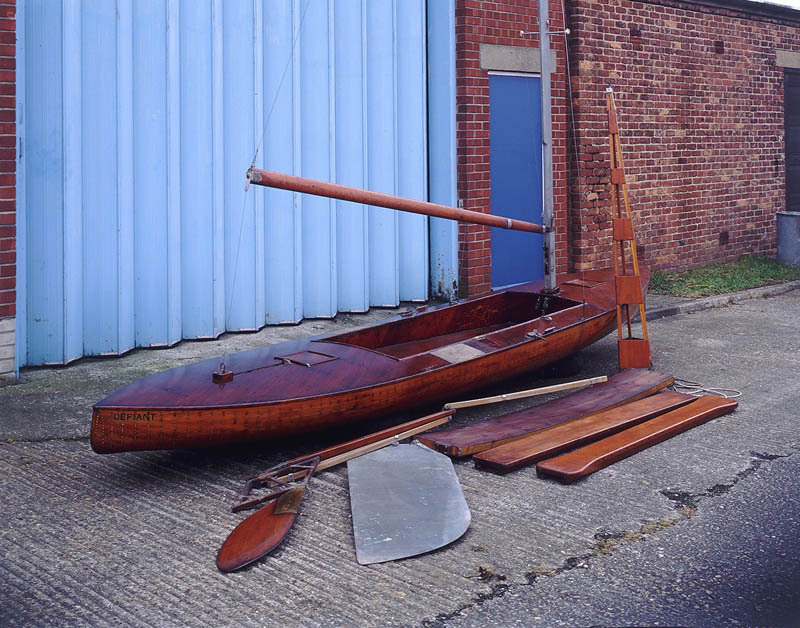 For Britain they left the sliding seats ashore and used a short centreboard, whilst in the US they added the planks and longer centreboard and accepted 40lbs excess weight. They also fitted a revised sloop rig which consisted of an unstayed mast with a rigid wooden spar as forestay, which, by the skin of its teeth, met the letter of the US rules' requirement for two masts. Valiant and East Anglian, the successful challengers in 1933. From Uffa Fox' "Sailing, Seamanship and Yacht Construction, 1934. Image © Uffa Fox Ltd", reproduced by kind permission of Tony Dixon. Well, they went to the USA, they won both sailing and even sailing/paddling races, and they brought the New York Trophy, along with a bunch of other silverware. They also came back with, and left behind, a firm determination to create a common rule set. 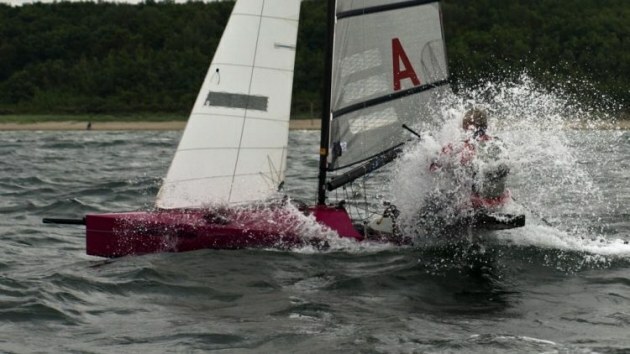 This came to pass within a very few years and a compromise sailing Canoe rule set emerged. Unsuprisingly Uffa became the dominant canoe designer in the UK until the post war era. The Fox boats were big, powerful boats with notably full ends: they carried maximum beam almost as far aft as possible, and the stern was close to the 90 degree limit imposed by the rules. K 23, Defiant. An Uffa Fox Canoe from 1934, believed to be the first canoe built in the UK to the international rules. Winner of several events in the pre war and immediate post war era. Preserved in the National Collection. Photograph © National Maritime Museum, Greenwich, London. The 1936 International rule set, was in its fundamentals, very similar to the rule set in use in 2012. There have been changes to the wording, sail measurement has become more sophisticated, and there is extra material to discourage lumps, bumps and distortions in the hull which only serve to meet measurement points. 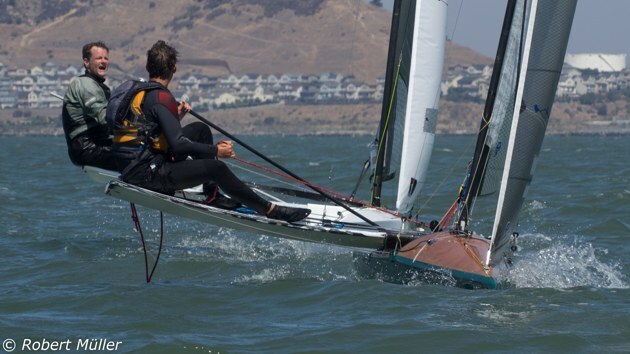 The main differences are that the original rule had a formula that permitted narrower hulls to have narrower waterline beam, and that the weight limit was controlled by a formula related to length and beam so that physically smaller boats could be lighter than larger ones. The sail area limit was and is the 10sq m widely used in European classes, and some other dimensions are metric round numbers, not imperial, so one would think there must have been some input from european rule sets. However available evidence is limited and seems to point towards the dialogue having been just between the US and the UK. Maybe using the metric numbers was a comromise when they fell between the UK and US ones? After the introduction of the International rule in 1936 and the return of the sliding seat to the UK the RCC began to abandon sailing races at Teddington, and tried a number of alternate venues. Amongst these was Frensham Pond (long before the formation of the sailing club), Langstone Harbour and Cowes, before they settled on the new club at Sandy Point on Hayling Island. HISC was to be a major centre of canoe racing in the UK for many years, although RCC involvement there was to diminish. Meanwhile Canoe sailing was spreading internationally, assisted no doubt by the publicity given by Uffa Fox' books. 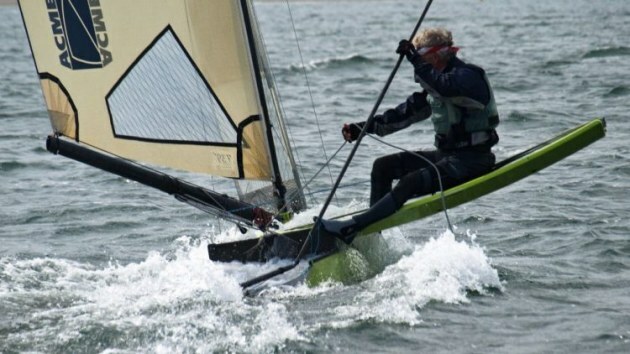 In 1938 in Australia Alan Payne, Bill Payne and Bryce Mortlock designed a two handed two sliding seat sailing Canoe, inspired by Uffa Fox' two handed "cruising" Canoe 'Brynhild', and this class is still active, whilst Frank Bethwaite records sailing a simple sliding seat canoe in New Zealand at about the same time. In 1936 there was a Canadian challenge for the NYCC trophy, using a canoe which was essentially of the fine ended 16*30 type, but which could be sloop rigged. This canoe did not appear to be a major advance on the boats that had competed in 1933, and the cup was retained fairly easily. The Canadian helm, Gordon Douglass was a good writer and his book is a valuable resource for canoe sailing information between the wars. Wake. Wkae was the successful defender in 1936. From Uffa Fox' "Sail and Power', 1936. A number of Swedish sailors came to Hayling Island in 1939 with their 10sq.m Canoes, which did not have the sliding seat. The Swedish boats were outclassed by the plank fitted British canoes. At this time there was an attempt to have the International Canoe adopted as an International event by the International Canoe Federation, but this, and further international competition, was halted by the outbreak of World War II. Although Uffa Fox had been the dominant designer since the 1930s this began to change after the war. Developments in the UK included fully battened sails, introduced after reading the writings of Dr Manfred Curry. These were not a new concept per se: as we have seen a type of full length battening was used on 19thC Canoes, and the use of modern fully battened sails dates back to at least the 1920s in Germany. The first fully battened sails in the UK had been built for John Aumonier on the Fox designed Canoe 'Wake' in about 1938, but little more development was done until after the war. British sailors have always been very resistant to the concept of fully battened sails, but the idea spread in the Canoe class until it became universal. Curry does not talk about canoe sailing in his book, but he includes photographs of an astonishingly modern looking 6.5 m racing craft he built in 1927 which features a 10sqm sloop rig with a bipod mast and a (manually adjusted) gybing centreboard. Although it has a vestigial transom on a long aft overhang and no sliding seat the boat just oozes canoe style. Another significant development at the time was the concave curved sliding seat which was developed by Austin Farrar, intitially without the "ladder" or foot holes. Alongside Farrar the two designers, Jack Holt and Ian Proctor, who were central to the post war dinghy sailing boom, became involved in designing canoes, Holt with hard chine boats that were intially intended to be low cost, whilst Proctor introduced - or strictly reintroduced - the concept of a chine at the stern after observing that the flow round the canoe stern was very disturbed in the round bilge boats, and that Holt's chined boats "had gone better than I thought they ought". Eastwind (above) and Conquest. These two boats were built for the 1952 defence of the NYCCCC. Eastwind was designed by Austin Farrar, somewhat in the Uffa Fox style, and Conquest was a radical hard chine design by Jack Holt. Image: © Peter Wells/RCC Archives. In 1952 the NYCC Challenge Trophy was won by the Lou Whitman of the USA in a single boat match on the River Alde in East Anglia. US teams defended the trophy twice more during the 1950s. Sweden (and their neighbours in Finland) continued to be a major force in canoe sailing, and one of the less obvious offshoots was the Finn Dinghy, which in many respects was a canoe hull shape truncated with a transom stern. Sweden has at least 6 active canoe classes, from the little A Class, which is 3m long by 1m beam with 4sqm of sail, and is intended for 10-14 year old sailors, right through to the D and E classes, which are 6m boats with 13m2 of sail, the D being a ballasted boat. 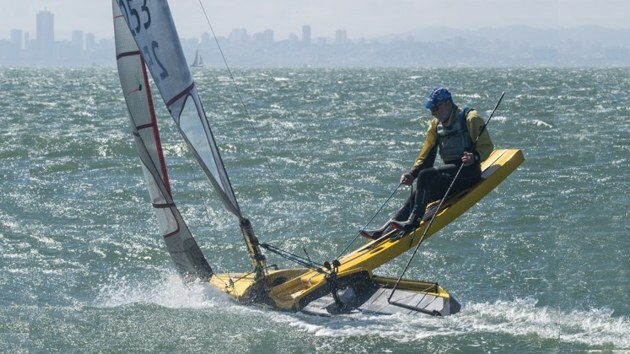 The native classes are boats with cockpits and more freeboard than the typical IC and have a small outward folding seat on each side of the boat - effectively tiny wings - to increase righting moment, only the IC having the true sliding seat. 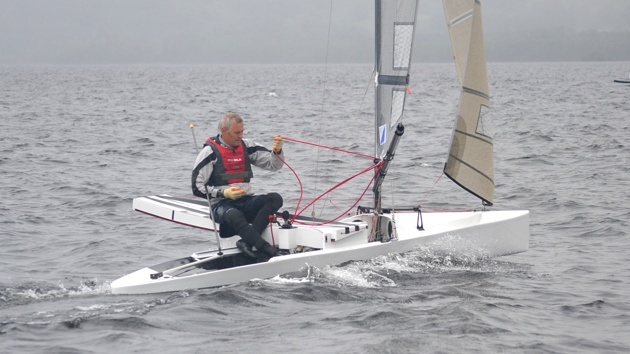 In Germany non sliding seat Canoes are also common, and the Taifun class continues to be active. To what extent was there European influence on the 1936 International rules? What was happening in the US after the 1930s?